Waking up with tinnitus and a whisky-induced headache isn’t the best way to kick off DAMNATION FESTIVAL 2018, but given that it is more than acceptable to start drinking before lunch on a day like this, I had the perfect excuse to give my hangover a bit of hair of the dog. It was brought on by seeing Corrosion of Conformity live in Sheffield – a fantastic gig, setting the bar very high ahead of Damnation. First up for me was CANCER, who have been around for ages and do a decent job at the old-school death metal thing. An enjoyable warm-up, if nothing else. Then came a trip to the second stage to see SAOR. The Scots put on a great show, their lovely blend of folk, black and post metal a real treat. We were then all turfed out on to the concourse outside the students’ union after a fire alarm (the same thing happened last year! ), where I spent an amusing ten minutes watching passing students’ reactions to seeing a hoard of metalheads gathered outside their normally not-metal-at-all student union. OHMNS were quite fun but who really got the pulses racing were ANAAL NAKRATH. They were introduced as ‘the nastiest band you’ll hear on this stage today’, which is saying something, and they lived up to that billing. I wasn’t too familiar with their material before the gig, but I’ll certainly be investigating more of their back catalogue. Carcass at Damnation 2008, Mithras 2009, Dragged into Sunlight 2011, Nails 2017 and now BATUSHKA 2018. Despite having a star-studded lineup there’s always a band that I’ll remember ahead of the rest at Damnation. The Polish black metal outfit have only released one album, but it has been enough to enthral the underground metal community. Indeed, the floor of Stylus was already packed ten minutes before they were due to take to the stage, and the performance didn’t disappoint. Batushka live feature eight members, including three backing vocalists, all of whom wear identical costumes. Their entrances to the stage were staggered to build tension and anticipation, which was somewhat offset by the fact they were ten minutes late anyway. Yet it was more than worth the wait – their unique take on black metal, coupled with their unique stage show (involving a lot of candles, incense and Eastern Orthodox imagery) was something to behold. Unfortunately, I was left feeling a bit disappointed by MOURNING BELOVETH, for two reasons. 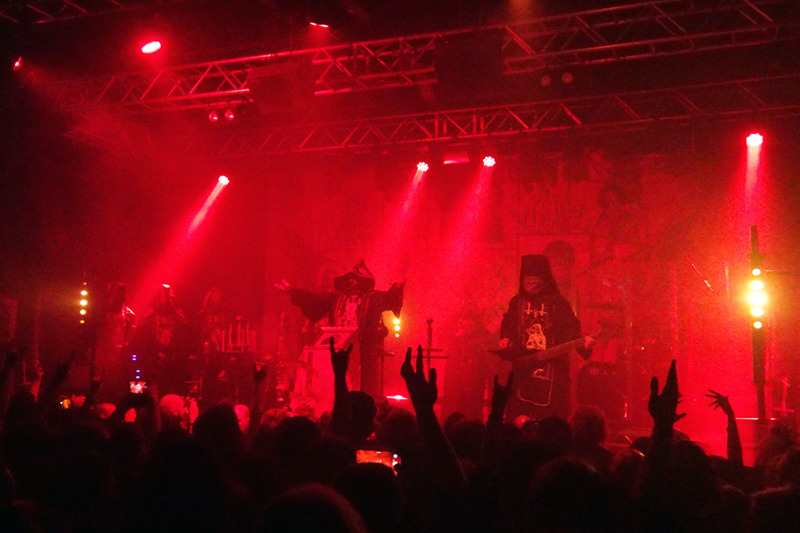 The first was that I left Batushka early in order to secure a good spot for the Irish doom metal legends, only to then find out that such a decision was totally unnecessary, as the size of the crowd was pretty small after all. Although they churned out all the classics, it felt like a bit of a comedown after the excellent performance I’d just witnessed. Last but not least, NAPALM DEATH were there to remind everyone why they deserved the headliner slot and why they’ve been around for over three decades now. The dust then settled, and the hangovers began to kick in – that’s it for 2018, and no doubt that 2019 will be just awesome as well.